← An Uncontainable Fire is Coming! I knew that the answer to this questions was going to be a defining moment in my life so I wanted to answer with thoughtfulness. I pondered and searched the through the memories of seasons of warfare to find the main source. After days of searching I knew that all of the reasons for warfare (money, relationships, health, etc) were not the answer that the Lord was looking for. Finally, I knew that I wasn’t to give Him an answer but to ask Him for the answer. Then He showed me that He was about to take me on a journey that would teach me how to live in the presence of His peace. Over the next couple of years I faced many situations and circumstances that quickly gripped me with the familiar fear and anxiety that caused such warfare. In the midst of those moments the Spirit led me, counseled me and imparted to me the gift of peace. I partnered with Him as I allowed a divine exchange to take place…peace for fear. It changed my life and my life experiences. There is peace in the place of trust and there is rest in the place of peace…then joy is restored. 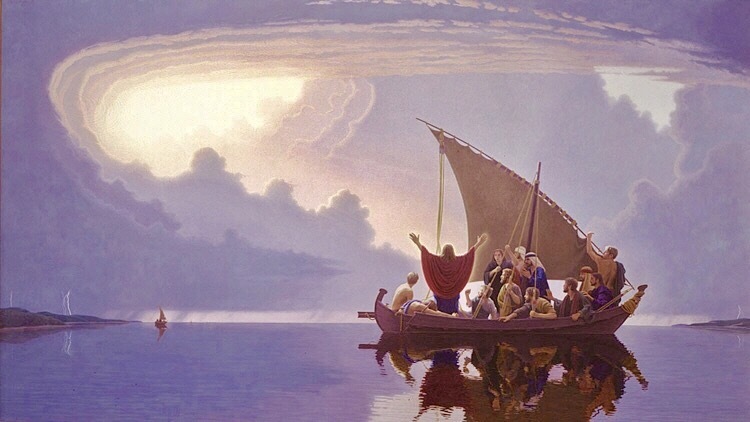 I often remember the story of the disciples in the boat on the stormy sea that seemingly threatened their lives. Fear gripped them, terror consumed them and anxiety was leading them. Yet, Jesus was on the boat with them sleeping. Why and how? He was resting in the perfect peace that comes from knowing that His Father was in control and His life would not be dictated or defined by circumstances and storms but by the hand of His Father. My days have been ordered and set by God. I can fully and completely trust in His goodness and care for me and my family. In all the “things” that we think are the sources of warfare; finances, relationships, health, careers, etc., we can bring them to the Prince of Peace and find rest and assurance of His plans to be accomplished. Did you know that Jesus is not worried at all about your life or the circumstances that surround you? He is not uninterested but rather fully confident in His plans to help you. One day, about twenty years ago, my husband was going through a time where the “weight of the world” was heavy upon him. He saw so much pain and injustice that he could not find joy. At our church one evening he saw joy come upon the congregation and people began to laugh uncontrollably. He felt offended and frustrated because he was feeling such despair. As the Lord would say this He would slap His knee and laugh aloud. Finally His laughter became contagious and my husband began to laugh with Him. He laughed louder and longer than anyone in the church. He was set free from the weight of worry that was robbing his peace and joy. Jesus knows what He is going to do about everything! God knew that He was going to calm the storm for His disciples and He knows what He’s going to do to calm your storm. You can go and rest with Him and find peace in His plans for your life. I wrote my book, “30 Days to Breakthrough: Peace” from my journey to see peace replace fear and anxiety in my life. Peace is available and it will calm the storm (even in the midst of a storm). It calms His child and ushers us into His dwelling place (Psalm 91). He will calm your storm and still the waves…stillness and peace will come! This is very meaningful to me, having sailed on our sailboat for several years. I have encountered storms in life and on the sea. They are both difficult when we don’t keep our eye on Jesus Christ. But as we accept his peace, it becomes a new world. Thank you for this article!